TheseNatural White 120lb Classic Laid Covers has a unique laid texture reminiscent of handmade paper. 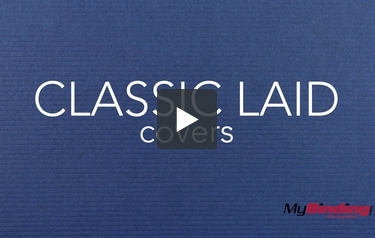 The wonderful texture of these Classic Laid Covers help to strengthen the impact of your message and adds an elegant and professional appearance to your presentations. These Natural White Classic Laid Covers are acid free with archival properties and carbon neutral. Plus, they contain post consumer fiber and can be used with your laser printer, inkjet printer, color copier or color printer (provided your printer is compatible with thicker paper stocks). Our window covers have a 1.75" x 4" window that is centered on the front cover 3" from the top edge. These Natural White Classic Laid Covers are perfect for business and personal correspondence.